Since the inception of Share International magazine, Benjamin Creme’s Master has provided articles to be published not only at the time they were written, but also whenever appropriate according to world circumstances. Indeed, many of these articles seem more relevant now than when they were first published. In the following article, the Master does not flinch from asking, and answering, questions which may arise in times of heightened tension. At every lecture he gave around the world, and virtually every day of his life, Benjamin Creme was asked numerous questions covering a vast range of topics. We are now drawing on this large recorded resource and publish answers provided by BC and his Master over the years, none of which have yet appeared in Share International. Q. The Bible says that when the Christ comes back the dead shall rise. What does this mean? Is it meant to be taken literally? Q. In Hinduism they say if you suffer it is due to bad actions in your previous life or in this life. Could you enlighten us about that? A. There are two great laws that govern all life on Earth – the Law of Karma, or the Law of Cause and Effect, and the Law of Rebirth or what we call reincarnation. By the functioning of the Law of Cause and Effect, every thought, every action that we have sets into motion a cause or causes. The effects stemming from these causes make our lives for good or ill. When it is for good we are happy. When it is for ill we are unhappy, we are suffering. But it is all caused by ourselves. Nobody is making us do this or that. We do it out of our inability to function as souls. We are souls in incarnation. The evolution of these souls in incarnation takes place according to a Plan – a Plan in the mind of the Logos. But we have free will. We can go along with that Plan – live together without pain, without suffering, without war, without hatred and violence, without corruption, without greed, without all the nasty, horrible happenings in the world. It is all coming from us. None of it is coming from outside. If the weather is not to our liking we say, “Oh, God is making us suffer.” God never makes us suffer. We make ourselves suffer all the time. From the very beginning of time, humanity has slaughtered one another, been greedy and selfish. Why? Because we are great, divine beings, souls in incarnation but wrapped up in matter. And that is the problem. The matter is unresponsive to the divinity, and so we incarnate. Q. Do we always reincarnate in the same country and race? A. Through the other great Law, the Law of Rebirth, we incarnate again and again, hundreds of thousands of times. Everybody in this room has had hundreds of thousands of incarnational experiences, as a man sometimes, as a woman at other times, in all the countries of the world probably. There is no pure race in the world. Everybody has been everything – black, white, brown, yellow, red. Everybody has been somewhere else in the world, has lived lives in various communities, traditions and races, and there is no pure race. Racial intolerance is absurd because everybody is mixed. So great has been the movement of humanity throughout the world over the centuries that a pure race is a nonsense. You can be black one life, white another, brown another, red another, yellow another. It makes no difference. You are the same soul incarnating in a physical body that can be changed every time. It is not usually totally different every time but it can be totally different for long incarnational episodes. So the idea of being intolerant of one race or another race, calling another race less evolved, or not worth anything, or a second-class citizen, is a total nonsense, an aberration of consciousness. Q. How does the Law of Karma help us evolve? A. There are the two great laws – the Law of Karma, or the Law of Cause and Effect, and in association with that, the Law of Rebirth. That creates all that happens in the world. Gradually the soul evolves and brings its reflection, the man or woman, into meditation in the first place, then into service, and continues to gradually evolve, becoming an aspirant, a disciple, an initiate, a higher initiate, until eventually he or she is a Master. When you are a Master, you have completed the evolution on Earth. Many of the Masters go out of the Earth, go to higher planets or occasionally out of the solar system altogether. Others, luckily for us, stay behind and help to oversee the evolution of the rest of us and the lower kingdoms. We are not the only kingdom on Earth. All of the kingdoms, and there are many that we do not see, are subject to this evolutionary Plan of our Logos. The Masters, and those with whom They work, the Angelic evolutions, the Deva evolutions, help and guide humanity along that path. Q. Could you describe the effect of the Masters being known in the world? Q. Can Maitreya’s ‘handprint’ be used by anyone? May twelve year-old children use it? A. The answer is yes, it can be used by anyone! Twelve years old or 112 years old. Share International has a very large reserve of ‘Letters to the Editor’ which have been processed over the years, confirmed to be genuine, but not yet published. Some of the Masters, in particular Maitreya and the Master Jesus, appeared at Benjamin Creme’s lectures and Transmission Meditations. They also appear in different guises. If the experiences were authenticated by Benjamin Creme’s Master, the letters are published. These experiences are given to inspire, guide or teach, often to heal and uplift. They also draw attention in an amusing way to some fixed intolerance to, for example, smoking or drinking. At times the Masters act as saving ‘angels’ in accidents, during wartime, earthquakes and other disasters. They use a ‘familiar’, a thoughtform, who seems totally real, and through whom the Master’s thoughts can be expressed. They can appear as a man, a woman, a child, at will. Occasionally They use the ‘blueprint’ of a real person, but in most cases the ‘familiar’ is an entirely new creation. On the evening of Wednesday 22 February 2017 after Transmission Meditation a group member and I were walking home in Amsterdam when I stumbled and fell. I hurt my head in the fall and was bleeding quite a lot. My friend stopped the traffic and asked a motorist if he could possibly give us a lift to my home – not that far away. He couldn’t – his car happened to be full of things because he was just moving house. She called her husband a minute later to ask the same question. She had only just ended the call when a taxi drove up to where we were sitting outside a shop but somewhat in the shadows; no one else apart from her husband knew where we were. He came right up onto the pavement right next to us. The taxi driver got out and said that a man had asked him to come and find us to take me home. We said that was wonderful but we had no money on us. “Oh, the man already paid me €10,” he said. But that was pretty amazing because if it was the motorist we’d asked for help he had driven off in a different direction and there aren’t any taxi-ranks in the direction from which the taxi appeared. And, in any case, I doubt whether anyone could have contacted and paid the taxi in the literally 3 to 4 minutes since my accident. “How kind of you and the gentleman who paid you,” we said (both thinking this was surely not a normal situation!). The young taxi driver replied: “That’s why we’re in the world isn’t it – to help one another!” We’ve concluded that we had miraculous help – and at lightning speed! J.K., Amsterdam Transmission Group, the Netherlands. (1) Four co-workers from the Paris Transmission Meditation group put on an exhibition of Share International magazine back-cover photographs on the weekend of 31 March 2017. The exhibition took place in a photographer’s studio and was entitled: ‘Sharing will save the world’. It lasted two days with an opening that attracted people because the event had been announced on the photographer’s social network. The exhibition and related activities took place in the cultural and artistic district of Beaubourg, that is to say in a street behind the main entrance of the Georges Pompidou Center. A co-worker had put up photographs, with a message from Maitreya, in the shop window of the studio. It attracted a lot of attention, even from children passing by. Maitreya had once said [at a similar photo exhibition in Tokyo] that if people around the world could see these back-page photos and think about them the world could change for the better and towards justice. It is true that one of Maitreya’s hopes is to open our hearts to the suffering of others. This is how we will change the world. The photo exhibitions serve that purpose. There were two co-workers permanently on the site, and we were surprised twice by the energy flowing, which was exactly like a blessing from Maitreya on Christmas Day. Even if we are used to feeling energy during all our photo exhibitions, this is the first time we have had such an experience. We were very happy because there are many associations working there, and they all have been flooded by energy. On Saturday morning and in early afternoon, there were no visitors yet and I remembered a question and answer from Share International magazine about visualizing the audience or visitors. Meanwhile, there was a constant stream of people looking at the six photos in the shop window. So, I visualized seeing the exhibition hall full of visitors. After a number of ‘visualizations’, I opened my eyes and saw Benjamin Creme on the threshold of the exhibition room. I rubbed my eyes, thinking that my imagination was playing me tricks, but it was not the case. He was there. I supposed that he was there because Benjamin Creme had been the editor-in-chief of Share International for decades. (2) During a meeting on 11 March 2017, in Paris, co-workers in charge of various activities gathered in order to give them time to exchange ideas and communicate to strengthen the unity of the group. During the afternoon, we were talking about the decline in the number of subscribers to Partage [Share] International magazine, and what could be done to improve its promotion, when a co-worker said: “Especially now that Benjamin is no longer here”. At that moment I suddenly saw Benjamin appear; he was standing in the room just in front of me. I had no doubt about what I was seeing. I asked the group to keep silent for a few minutes. I hesitated to tell the group what I had seen because a friend of mine had seen Benjamin in another context and some of the people to whom she told the story started to make fun of her. The next day I decided to write my story to the magazine because I did not want to keep it only for myself because some people think that Benjamin is no longer there, while I know that it is clearly false, at least, as far as I am concerned. What I want to ask you is: Were we being protected in some way? We just can’t believe how else we could have got out of this without being either killed or badly injured. B.F., Frimley Green, Surrey, UK. On 10 May 2001 I had an experience whilst in the Prince Charles Hospital at Chermside in Brisbane, Queensland. I was having a growth removed from my hand. Whilst sitting in the waiting room before going to the operating theatre a jovial young man with blonde hair stuck his head around the corner and was smiling and grinning at me and moving his head back and forth like a clown does to a child. It was similar to a clown performing to a child. He was dressed in a medical gown and hat. Afterwards, while I was lying on the operating table in the theatre, he came in to the room and came straight up to me and stroked my hand where the surgeon cut the hand, not on the growth. He then walked over to the surgeon after this and introduced himself as ‘Shaun’. I was surprised at this young man’s behaviour and thought it was certainly not something a young doctor would do to a patient. Can you confirm for me who was this young man? (1)Around 1998 I was walking in the park with a girlfriend. I was caught in many thoughts and in despair. A man came towards us from a side path. He was 190cm tall, dressed in a wonderful light blue suit. His eyes shone (also blue), he had so much radiance that I did not want to look at him. He came between my friend and me and looked at me. A heartfelt love reached me, something that I had never experienced. My despair and worries disappeared. When we wanted to look at him again he had vanished – simply from the middle of the footpath. I wonder very much who he was. Could you tell me? (2) Also at work in 2000 there was much happening to me with bullying and exclusion. Inwardly I called to God and for a love that would reach everyone. Suddenly I saw a man in the hall. Small and dressed poorly, so that I thought he must be a homeless person. As he turned around he had a beautiful rose in one hand and had a smile on his face. Then he was gone. The hope remained with me that something may change at my place of work. Was he Jesus? It happened to me at the Mind Body Spirit Festival in Sydney on 22 November 2001. While looking at Maitreya’s ‘hand’ card, I prayed to Maitreya for an experience with the Masters in order to make my reappearance work much more effective. After talking with people about the reappearance of Christ and Masters, they sometimes ask about my personal experiences with Masters. But I have to say that I do not have such experiences. I sometimes feel awkward in conversation with people after such a question. Two hours later, I was alone at our stand looking at the Emergence Quarterly newspaper. I had noticed someone standing at the small table where the miracle photos were displayed. When I looked up, a young man looked at me and said “Hi!” raising his right hand. I stood up and approached him. He said, “Who is she? Who is she?” looking at Maitreya’s picture in Nairobi. I felt very strange, because normally people ask “Who is he?” I said, “This is Mary Akatsa, a healer but I don’t know the correct pronunciation of her name. She helps a lot of people.” He said, “Thank you,” and was gone! He had very beautiful black eyes with short hair and wore a checked scarf around his neck which Palestinian people wear. His raised hand reminded me of Maitreya’s ‘hand’. Was this my personal experience with a Master? Was he Maitreya or Master Jesus? This photograph taken on 23 December 2015 by L.J. (Netherlands) of her young niece shows a light blessing from the Master Jesus. Photograph of P.S. in her husband studio, in August 2014, shows a light blessing from the Master Jesus. Sent by P.S., Berlin, Germany. On 22 August 2016, Alain Lévesque, a chef at an elderly person’s residence in Quebec, Canada, was amazed to see, after cutting a potato in half, the sign of a cross. Émilien Morin, president of the residents’ committee at Le Mieux Vivre Residence in Grand-Rivière said that Lévesque saw it was a cross and took it to be a religious sign meaning: “I’m here”. We would like to express our thanks for the many positive and encouraging comments received about Share International magazine in recent months. Your support is appreciated. We are keenly aware of Benjamin Creme’s physical absence but we hope our equally keen awareness of his continuing help and guidance in our work will be welcome news to our readers. Understandably, at times of great change questions arise, and supporters and critics alike hope for or expect answers. Articles by Benjamin Creme’s Master provide a source of insight as they deal with difficult issues and have proved their extraordinary aptness even when reprinted years after they were written. In the new circumstances we think it important to revisit the aims and functions of this publication. 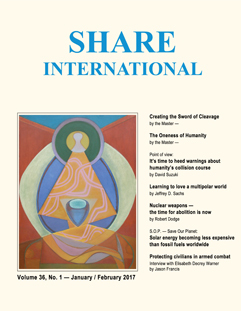 Share International magazine is a vehicle for Maitreya’s and Benjamin Creme’s Master’s ideas, inspiration and insight. It is one of the main means by which we make known the presence in the world today of Maitreya and the Masters of Wisdom. The Master has explained the past, illuminated the present and outlined the contours of the brilliant future civilization, which can be humanity’s if we take steps to implement Maitreya’s priorities. The Master’s articles, messages from Maitreya, answers given by Benjamin Creme to readers’ questions, the descriptions of meetings with Masters or Their representatives, the signs and miracles manifested by Maitreya and the Masters – all have given hope and inspiration to the world. The needed changes are spelled out, possible solutions pointed up, difficulties highlighted; wise advice is given and a vision held up of a fair and sane world in which the needs of all are met, where sharing and justice are the norm, allowing all to evolve into the divine beings we are in potential. Yet another function of Share International is that whenever these ideas elicit an intuitive response they have an effect on the mental planes where they are picked up by sensitive, creative minds. The ideas are implemented and so civilization proceeds. Similarly, ideas go out on the mental planes as information about the Emergence of Maitreya and the Masters is given out at public lectures. A further aspect of our work has been to provide more than facts, to contribute to the development of a new way of thinking. It is through a change of heart that humanity will make the changes the world needs. A subtle function of this magazine is the following: in the Master’s articles and Benjamin Creme’s answers to questions, the reader has a means to deepen his understanding of the nature of Reality and of his own nature as an integral part of that greater life. This promotes the growth of the intuition and the broadening of consciousness. The Masters live outside of time: “Masters see reality in the complete absence of time,” to quote Benjamin Creme, who also talked of our, humanity’s, obsession with time. The Master’s very first article for Share International magazine dealt with the fact that time is a state of mind. Except when they were about a specific event, a particular moment in history, His articles are timeless. They were written from a far wider perspective than ours. They contain an insight into the sweep of history and humanity’s likely responses. We have no hesitation in recommending them for renewed reading and study. Choosing an article appropriate for any given month and set of world circumstances requires protracted consideration of the main factors at play in the world at the time of the editorial process. The selection is made with a view to addressing the relevant current issues. Fortunately, Benjamin Creme’s Master has provided a vast number of articles. Please see the introduction to each section for further explanation on how and why we present particular articles and various reports. Maitreya’s priorities – the provision of enough food, adequate housing, healthcare and education as basic universal human rights – are another major focus of our work, but as non-experts we call in the specialist knowledge of many well-known figures. The editorial team investigates current events and breakthroughs in line with Hierarchical insight. We choose experts whose ideas most closely approximate those of Maitreya. In this way, we can draw attention to very hopeful developments, which show clearly that humanity is responding to His presence and inspiration. Benjamin Creme’s Master indicated in the past that Share International magazine could play an educational role in the future and He would continue His association with it. Benjamin Creme also appealed to its well-wishers to continue to support it by subscribing. The Masters know that we can manage for the short time remaining. We know we are not abandoned – neither by Benjamin Creme nor by the Hierarchy. The Plan is safe in the hands of Maitreya and the Masters. *Alice A.Bailey, Esoteric Psychology Volume II, the Lucis Trust. We present a selection of quotations on the theme of ‘The rise of people power’. The quotations are taken from Maitreya (Messages from Maitreya the Christ and Maitreya’s Teachings – The Laws of Life), Benjamin Creme’s Master (A Master Speaks and Share International), and Benjamin Creme’s writings. The voice of the people is rising, nay, has risen, and is calling men to declare themselves. Many today realize that the way to the future is through a new and just order, a new Brotherhood of man, a new spirit of co-operation between old enemies. All this is possible today and is being effected. It is important to maintain a growing number of marches, not now and again but continually, and these sustained demonstrations will have a gradual impact on government thinking. It is difficult for us to estimate the value of such demonstrations but the Masters are in no doubt that they are very powerful levers of change. We must organise them more and more frequently and with even greater numbers. ‘People power’ will transform the world. (Benjamin Creme, Unity in Diversity) …. Today, a great new light is awakening humanity to its purpose and destiny. That shining brilliance will reveal to men the Purpose underlying the Will of God, and will galvanize mankind into the creation of those relationships and forms which will serve to demonstrate that Purpose in all its beauty and power. I rely on all those with a knowledge of your brothers’ needs, a sympathy for the sufferings of so many, and a will to change all that. May you be among those upon whom I may call, that together we can usher in a new and better world. In 1984 an Irish Republican Army (IRA)* bomb planted in the Grand Hotel in Brighton, UK, killed Jo Berry’s father, Sir Anthony Berry. Jo knew she had a choice: to harbour feelings of hatred and anger or to seek understanding and so bring peace back into her life. She chose peace. Patrick Magee, the man convicted of planting the bomb, had joined the IRA after much considered thought, having seen this as the only way to respond to the oppression and suffering he witnessed in his community. Following his release from prison, Jo sought out a meeting with him. Since that meeting they have formed a remarkable friendship based on compassion and respect, and have travelled the world spreading a message of peace and understanding. Jo founded the charity Building Bridges for Peace in 2009, which works to understand violence and resolve conflict around the world non-violently. She advocates empathy as the biggest weapon we have to end conflict. With political, religious and racial divides deepening as global and local events unfold, her words offer a message of hope and encourage us all to see the humanity in others. Jo was interviewed for Share International by Victoria Gater. Share International: When did you first start thinking about peace? Jo Berry: As a teenager I thought a lot about peace and how I could contribute. I got very distressed with the wars and violent conflicts that were happening. I remember looking for a career that would help bring peace and couldn’t find one. Then I discovered meditation and inner peace, and that seemed a way to bring peace, and I spent a few years living in the Himalayas focussing on that. I became quite detached from the world, which didn’t feel quite right, but I didn’t know what else to do. And then the bomb went off and I couldn’t be detached any more. SI: Please say more about that time. JB: My father was a Member of Parliament attending the Conservative Party conference in Brighton on 12 October 1984 when the IRA put a bomb in the hotel and five people were killed, including him. I had been about to leave for Africa on a one-way ticket and had my rucksack packed but the bomb changed everything and an emotional journey started for me. I remember going to St James’ Church, Piccadilly, in London a few days later, sitting in a pew, and deciding that I was going to find a way of making something positive out of it: to bring meaning and to understand those who had killed my Dad. I knew it was the IRA and I wanted to understand them. I didn’t tell anybody of my decision. It was a silent, private commitment to do something different. I didn’t want to be a victim or to be bitter. I didn’t want to have an enemy. In 1984 the IRA were seen and portrayed by the press and politicians the same way as ISIS is seen today – as inhumane evil monsters, and I didn’t want to do that. SI: So what happened next? JB: I trusted that life would bring me the experiences I needed, to know how to proceed, and just a few weeks later I had the most extraordinary and transformative experience. I was on the tube [underground train] going home and I had a very strong sense I should get out, so I did and found myself at 1am in King’s Cross station in London, wondering what on earth I was doing and how I was going to get home, and looking for a taxi. There was a young man next to me also looking for a taxi so we started talking and found we were going to a similar area so said we’d share one. I could tell he was from Northern Ireland. In the taxi I told him that my father had been killed by the IRA and that I wanted to understand those who had killed him and bring something positive out of it. He said: “Well that’s a real coincidence because my brother was in the IRA and was killed by a British soldier last year.” So there we were, two people who should have been enemies, and yet we spoke of a world where peace was possible, where nobody got killed, where nobody got demonized, but where everyone respected each other. I remember leaving the taxi and thinking: this is one way I could create peace, by building a bridge across a divide, which hadn’t occurred to me before, and that was the first bridge that I built, with this young man. The meeting gave me the idea. I then went to Belfast, Northern Ireland and started meeting people, which helped me to rehumanize the other and to understand about the conflict. I started being asked to speak at prisons and various groups. SI: Can you talk about the time you first met Patrick Magee? JB: Patrick Magee was released from prison in 2000 as part of the Good Friday peace process [a major international Peace Agreement between the British and Irish governments]. He was no longer a member of the IRA. I met him in a private house in Dublin. He was willing to meet me because he was committed to the peace process and was open to meeting people he had hurt. He was very polite and respectful and shared with me why he had joined the IRA and I shared about my trips to Belfast and about my Dad. He definitely had sensitivity but he was justifying killing my Dad and that was hard to hear. But he then stopped talking and looked at me, he took off his glasses and rubbed his eye and said, “I don’t know who I am any more. I want to hear your anger and your pain, what can I do to help you?” And in that moment I knew he had taken off his political hat. He would say later that he had moved from his head to his heart, and he was no longer justifying, and from that point he recognized that he had lost some of his humanity through using violence. Many times later he said that he wasn’t expecting me to be so open. That’s what had touched him. He had been disarmed by my empathy. SI: So it wasn’t just an impact in that meeting – you’re saying that something changed in him? JB: Yes. He’s still on the journey, experiencing the implications of that change. One of the first things Pat said publicly with me was that he now knows he could have had a cup of tea with my Dad, but when he planted that bomb he wasn’t seeing human beings, only legitimate targets, and cups of tea with the IRA were not on the agenda for the Conservative government either; but the fact that he can see that is very powerful, because if people can have those cups of tea it means respect, empathy, dialogue, hearing each other’s stories. What happened for me through hearing his story was I reached an understanding that had I lived his life, I might possibly have made the same choices. I had a realization that there is no enemy, no judgement or blame, there is nothing to forgive. SI: And the two of you now work together? JB: Yes, we have become friends; it’s an unusual friendship. We have spoken to groups in prisons, schools, universities, at conferences, all over Europe, Rwanda, Lebanon, Israel and Palestine. We share our story and when we stop talking we open ourselves to questions. People take what they need from our story. Someone might make a decision afterwards to contact an estranged person. People also change how they see what we call the perpetrators in their lives or change something in themselves or maybe it inspires them to go on a journey to do something they need to do. It’s a privilege to have this story because of the huge impact it has on people. Straight away people get into a very deep place within themselves. It’s symbolic – you have two people on a stage who should be enemies and they’re not acting as you imagine they would. It’s giving a different point of view to the normal one. SI: Can you say more about your work in Israel and Palestine? JB: We were asked to go there by Parent Circle, who are parents on both sides who have had loved ones killed. The first day there was an amazing group called Combatants for Peace. I was aware of the struggles in the room. We shared our story and I remember thinking, “why have I come here, what am I doing? Our conflict is kind of sorted. We don’t have this kind of challenge on a daily level like these people”. But after we stopped talking they started a deep conversation amongst themselves about their challenges, having taken permission and safety for a new conversation to start. One man said that the fact that we were here meant that we care and they really appreciated that, and the fact that we didn’t impose a solution on them was fantastic. He said they were seeing their conflict mirrored back in a different way and that was a gift. So that’s when I thought: I’ve got to trust this process and carry on. I think it’s really helpful for people from different conflicts to visit and share. People can hear things that they wouldn’t hear if their own group said it. SI: What are your thoughts on the concept of forgiveness? JB: I no longer use the word forgiveness unless I’ve got time to explain what I mean. I think it puts inappropriate pressure on victims to forgive, that if they don’t, then they are not good people. Forgiveness is a journey and actually I think quite often when people say “I forgive you”, it keeps the person who has been forgiven in a place of having done something ‘wrong’ and puts the person who has said it in a place of ‘right’, and I’m looking at going beyond right and wrong, so I prefer to use the words “unbounded em_pathy”. It isn’t about excusing what people do at all but it’s about really understanding the roots of why someone does what they do. There are probably a few people in the world who are psychopaths with zero empathy but most people have a story and to understand that story is really helpful. I also know amazing people who say they can’t forgive, and don’t want to forgive, but it doesn’t stop them from doing really good work. So the idea that you are either really bitter or you forgive – I don’t think it’s as simple as that. SI: Is there anything you want to say about the relevance of your work today, with the apparent rise of hatred around the world? JB: I think more than ever that blame is seen as an acceptable way, and we all need to challenge this culture of blame. We need to have conversations with those we fundamentally disagree with, to create safe places to bring people together with different views to listen to each other and I believe it’s possible to do that. I’ve seen it happen and people change. There are many types of listening circles and forums. People can also just do it waiting for a bus or in a shop. But I don’t believe any more it’s OK to sit at home and do nothing; we need to be change-makers bringing love and compassion into the world. More than 20 million people in Yemen, South Sudan, Somalia and Nigeria face famine and starvation in what the UN’s top relief official called “…the largest humanitarian crisis since the creation of the UN”. Without co-ordinated global assistance, “people will simply starve to death” and “many more will suffer and die from disease”, Stephen O’Brien, the UN Under-Secretary-General for Humanitarian Affairs, told the UN Security Council in March 2017. The UN’s Stephen O’Brien said the largest humanitarian crisis is in Yemen where two-thirds of the population – 18.8 million people – need aid and more than 7 million people are hungry. Yemen is embroiled in conflict as Saudi Arabia and Iran wage a proxy war in the Arab world’s poorest country. In South Sudan, which has been ravaged by a three-year civil war, O’Brien said, “the situation is worse than it has ever been. The famine in South Sudan is man-made. Parties to the conflict are parties to the famine – as are those not intervening to make the violence stop.” O’Brien said more than 7.5 million people need aid, up by 1.4 million from 2016, and about 3.4 million South Sudanese are displaced by fighting including almost 200,000 who have fled the country since January 2017. In Somalia, which is in its third year of drought, more than half the population – 6.2 million people – need humanitarian assistance and protection, including 2.9 million who are at risk of famine and require immediate help “to save or sustain their lives”. In northeast Nigeria, a seven-year uprising by the Islamic extremist group Boko Haram has killed more than 20,000 people and driven 2.6 million from their homes. Over $1 billion is needed to meet the critical needs of more than 8.5 million people in three northeastern states. The Elders are expressing alarm at new measures adopted by the Israeli parliament, which retrospectively recognize Jewish settlements in the occupied territories that are built on confiscated Palestinian land. “This law is highly damaging both to the prospects for peace in the region, and to Israel’s international reputation as a state that respects the rule of law,” said Kofi Annan, Secretary General of the United Nations, 1997-2006. The so-called ‘Regularization Law’ is a provocative violation of international law that further blights the chances of a just and durable solution to the Israeli-Palestinian conflict. It also runs directly against UN Security Council Resolution 2334, passed in December 2016, which reaffirms that “the cessation of all Israeli settlement activities is essential for salvaging a two-state solution, and calls for affirmative steps to be taken immediately to reverse the negative trends on the ground that are imperilling the two-state solution”. The majority of nations at the UN – more than 123 – voted in favour of negotiations to outlaw nuclear weapons, but a ban treaty has no support from the states that actually have nuclear weapons. The nine known nuclear states – the US, China, France, Britain, Russia, India, Pakistan, Israel and North Korea – all oppose a ban treaty. Kim Won-soo also expressed the hope that the instrument will strengthen the Nuclear Non-Proliferation Treaty (NPT) and bring the world closer to the total elimination of nuclear weapons; and that it would make an important contribution both to nuclear disarmament and to the ultimate objective of general and complete disarmament. According to 2016 estimates, more than 15,000 nuclear warheads remain in global stockpiles. This is a considerable reduction from the stocks maintained during the Cold War, but the pace of the reduction has slowed in recent years, and concerns are rising over continued reliance on nuclear weapons in security doctrines and continuing programmes to modernize and improve nuclear weapons. Kim Won-soo acknowledged that a sense of dismissiveness now permeates international deliberations on disarmament, and warned that the general public seems to be losing interest in the issue. “We need to find a new way to inspire and motivate the public in support of disarmament, in the same way that they have been energized to respond to the challenge of climate change, an existential threat facing humanity,” he stated. “The possession of nuclear weapons, which are linked with the threat of their use, is fundamentally incompatible with humanity’s common aspirations for peace and security,” he said, and stressed that a “new and destabilizing” arms races could exacerbate regional and global tension. ‘Demonstrations matter – they create the kind of power politicians despise’ is the title of a recent article in The Guardian newspaper (UK) by Paul Mason, a writer and broadcaster on economics and social justice. Whether popular protests cause more than derision in political echelons is, of course, a crucial question; can protests really be said to matter? Mason is in no doubt as he presents a broad-brush picture of very recent demonstrations across Europe: “The tide is turning and you can feel it on the streets of the world’s capital cities. On Sunday, hundreds of peaceful protesters were arrested in Moscow and St Petersburg, after thousands massed in unsanctioned demonstrations against corruption. “There were similar scenes in Minsk, where punitive taxes on the unemployed have driven people to the streets. In February, half a million Romanians forced their government to abandon a law pardoning corrupt officials, by taking to the streets. “In Britain, in the month of March, three major protests have taken place: a demo to save the National Health Service that drew up to 250,000 people; a 30,000-strong march against racism; and, most recently, a protest in favour of staying in the EU, again numbering more than 100,000 people. Gathering together with hundreds of thousands of like-minded fellow citizens is empowering, and politicians know it. “Such mass gestures are about finding each other, testing out arguments, and creating and transforming messages,” writes Mason. Mason draws the global protest pattern more broadly, referring to the 21 January resistance to Trump in the US: the country “experienced possibly the biggest mass mobilization in its history – with an estimated 4.2 million people protesting against Trump’s inauguration in towns and cities across America”. “What social media adds to such mobilizations is not just visibility but the intensification of the shared experience. Each block of 1,000 protesters on any demo in the developed world is really a thousand nodes on a network containing tens of thousands of other nodes. It is a moving and incessant information-distributing machine. “And that is why the first move of any government that wants to curtail democracy is to curtail the right to demonstrate. Putin outlawed the majority of planned demos last weekend, but they went ahead regardless. Slammed into the police vans were not just brave but faceless Russians, but people with Facebook and Twitter followers all over the planet. “When the people decide to live …” wrote Tunisian poet Abu al-Qasim al-Shabi, “chains will be broken”. Those words were widely shared in 2011 during the Arab Spring. Since last year’s presidential election, Americans are more anxious than ever. A survey conducted in January found two-thirds of Americans say the future of the nation is causing them stress. Jeffrey Sachs, one of the world’s top economists and a foremost expert in sustainable development, has a remedy. He’s on a mission to show that America’s problems are big, but solvable. In his latest book, Building the New American Economy: Smart, Fair and Sustainable, published on the eve of Donald Trump’s inauguration, Sachs writes that the keys to success in building a new American economy can be summarized in the three words: smart, fair and sustainable. As a leader for the United Nations Sustainable Development Solutions Network, Sachs and his team created an index, using indicators of all 17 of the Goals measuring where countries currently stand, in terms of poverty, health access, death rates from various disease categories, gender equity, tons of carbon dioxide emissions per capita, and the so-called ‘Gini coefficient’, which measures the inequality of income within a society, noting the progress that the countries will need to make to achieve the recently-adopted SDGs. He says the results were eye-opening: overall the United States ranks 22nd out of 34 high-income countries, far behind the lead held by Sweden, Denmark, Norway and Switzerland. What is the difference between these high-functioning economies, such as Sweden and the United States? Sachs points to two key factors. He explains: “The simple truth is that America doesn’t raise enough tax revenues to finance the key public investments for our future.” The Scandinavian social democracies, which tax around 50 per cent of GDP have smaller budget deficits, modern infrastructure and much greener economies, as well as a host of public services, including free college tuition, free public healthcare, guaranteed maternity leave – and quality healthcare, as a result. While the idea of increasing tax revenues has long been outside of the American political mainstream, Sachs remarks that Bernie Sanders, who decisively rallied young voters during the US presidential elections, ran his campaign on mobilizing vastly more revenues for much greater public investment. America’s poverty rate of 17 per cent is the highest among the high-income countries. On this, Sachs comments: “…the United States is the most unequal in our modern history, at least for the last century, and this is a grim fact of life that we feel in our society, and it shows up in so many of the ills that beset so much of our population.” He laments: “Of course poverty is the word not mentioned in any campaign, except Bernie Sanders’. It’s not mentioned in any presidential debate, because the poor are supposed to behave themselves and be out of sight, or be locked up in prison. But why don’t we set a goal for fighting poverty?” Recounting the war on poverty adopted in the US during the Lyndon B. Johnson Administration (1963-69), he says, “If you look at the data, it had a tremendously powerful effect of lowering the poverty rate – and then Johnson went and blew it by fighting the Vietnam War, and destroyed his own war on poverty. But not because it can’t be done.” In his book, Sachs suggests a goal to reduce poverty by 50 per cent. He contends that the sharp widening of inequalities, which started in the 1970s, is a direct cause of a societal collapse in trust, something pollsters have noted as an ever-rising trend. More than any other threat facing the country at this time, he says it is the “…collapse in civic virtue, meaning the honesty and trust that enables the country to function as a decent, forward-looking, optimistic nation.” He adds that the defining characteristic of American society in our day is that Americans trust neither their political institutions nor each other, and counsels that we need a conscious effort to re-establish trust by making fair play an explicit part of the national agenda. Jeffrey D. Sachs is Professor of Sustainable Development and Professor of Health Policy and Management at Columbia University, New York, and is Director of Columbia’s Center for Sustainable Development and the UN Sustainable Development Solutions Network. Sachs, Jeffrey D., Building the New American Economy: Smart, Fair and Sustainable, Columbia University Press, 2017.